I couldn't help noticing your question : The technique of ECG guidance has been around for decades. It has been well validated (see http://www.cja-jca.org/cgi/content/full/53/10/978 for a 2006 study showing ECHO correlation with P wave morphology) and commercialized in Europe by BBraun (see www.cvc.-partner.com). If you write me directly at [email protected], I can send you representative tracings from 5 cm above the SVC-atrial junction to 6 cm below it in 1 cm increments and you can see for yourself how obvious the P wave changes are to distinguish. Although the idea of using a sterile sheath or looking at a monitor may initially seem cumbersome, like any new technique, once you've done it a few times it becomes second nature. There are only 3 steps to using the PacerView: attach the leads to the patient, attach the Grabber to the guide wire, and snap the monitor ECG lead onto the PacerView. With 2 or 3 procedures, you will get a feel for the P waves. 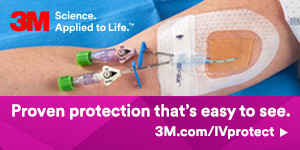 Using the sterile sheath for the connector is no more difficult than using it for your ultrasound probe. I have now placed 5 PICC's using ECG guidance. It is very simple and I was able to accurately put the tip where I wanted it to be. I anticipate doing about 10 more before I have enough data and confidence to not need to do the chest x-ray. I will document tip location with an ECG strip. This means many fewer chest x rays and considerable time savings. In this climate of watching every expenditure and saving where we can, this is big!